France’s second-largest city in terms of population, in many ways Lyon comes in first. Indeed, it has everything a city needs to seduce. 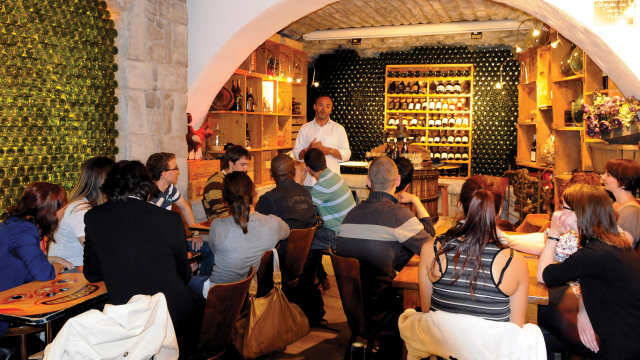 Its high-quality cultural offerings, a prime selection of eateries ranging from little bouchons (bar/restaurants specific to Lyon) to Paul Bocuse’s establishments, and the presence of 100,000 students to “live it up” with at the memorable parties to which Lyon invites you. Its wharves and old, pastel-coloured districts represent just as many invitations to walk about and to discover. Stroll around the city of silks brocaded with gold and silver threads. At night, bathed in light, Lyon dazzles; discover its beauty for yourself (Lyon was listed as a UNESCO World Heritage Centre in 1998), and let yourself be carried away by its energy and its art of living. Located on a peninsula surrounded by two rivers in the centre of Lyon, our school’s facilities are inside a beautiful 19th-century building on the banks of the Rhone in the midst of the cultural and festive offerings of the city’s downtown core. The school features 8 spacious, bright classrooms. With its high ceilings, each of these classrooms proudly boasts its own f ireplace. The facilities are equipped with wifi service so that you can access your e-mail and surf the web free of charge; furthermore, a number of fixed computer stations are available to you. As the centre is located just a few steps away from Lyon’s largest city square, the Place Bellecour, right after class you can head over to the district’s many cafes and restaurants, which serve as the favourite meeting spots of Lyon’s many students. Lyon’s most popular pedestrian shopping zones are located in the immediate vicinity of the course centre. DELF and TCF international recognised certifications, special exams’ preparation package modules, including courses fees and accommodation. Wide range of accommodation (regularly visited, high quality host family accommodation, spacious, fully equipped student apartments, hotel).